On the seventeenth of this month, we commemorate our Venerable Father Alexios the Man of God. Which you alone carried anew into the heavens Father. On the seventeenth Alexios was taken by death. He was from Old Rome, the only-begotten son of noble and wealthy parents. His fathers name was Euphemianos and his mother was Aglais, and they lived during the reign of Theodosius the Great (379-395). 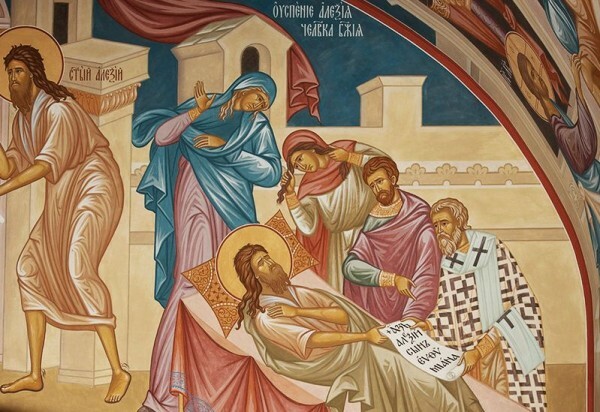 After his wedding took place, and the nuptial bed-chamber had been prepared, at that time, when the groom was to sleep with his bride, the Saint gave a ring to his bride, and he blessed her and bid farewell, secretly withdrawing from the house of his father, and he went to Edessa. There he dwelt in the church for eighteen years, dressed in poor and ragged garments, and fed with the help and mercy of the Christians. He withdrew from there (for it was not possible to always hide his virtue, so that crowds often fled to him, and they bothered his silence), and he desired to go to Tarsus in Cilicia, that he may dwell in the Church of the Apostle Paul. His desire was not met however, for a storm came against his ship and pushed it to another place. 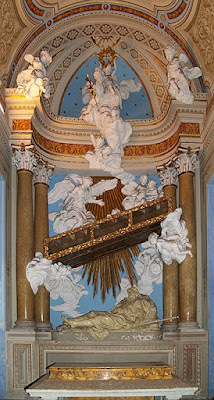 He therefore returned again to Rome, and went to his father's house unrecognizable, where he sat at the door, and there he spent the rest of his life, derided by his own servants, mocked, and he suffered as much as a stranger can suffer, so that he had no boldness before vain and disorderly men. * The Church of Sant' Alessio, also known as the Church of Saint Boniface, on the Aventine Hill at Rome is believed today to rest over the site of the house of Euphemianos, and the stairs on which Alexios sat are said to still be preserved there. 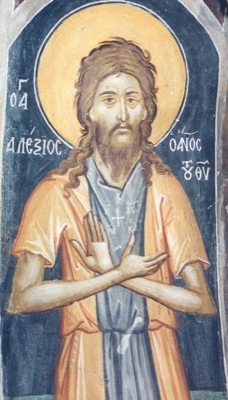 At the beginning of the 11th century Alexios became a very popular saint in Rome and there are a lot of frescoes with him in the churches of the whole West, though his veneration is said to have been more popular in the East prior to this, given the status of the Fools for Christ in the East. The relics of the Saint were uncovered in the year 1216, being kept in the Church of Saint Boniface. Later, some parts of his relics, such as the skull of Saint Alexios, were given by the Roman Emperor Manuel Palaiologos in 1398 to the Holy Lavra Monastery at Kalavryta. Though thou didst bud forth from a renowned and notable root, and though thou didst blossom from a city famed for her great imperial dignity, yet didst thou scorn all things as corruptible and fleeting, striving to be joined to Christ thy Master for ever. Entreat Him, O Alexios most wise, fervently for our souls. 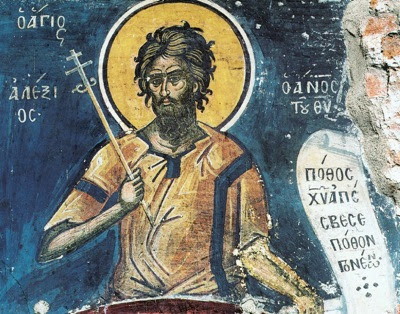 As we celebrate today with fitting rev'rence the all-holy festival of Saint Alexios the all-blest, with hymns we praise him and cry aloud: Rejoice, thou gladsome adornment of venerable men.